Here we have 4 Beautiful Ornamental Scrolls Frames! I love how romantic this gorgeous frame image is, lots of swirly Scroll shapes here, with delicate flowers tucked in and an ornate shell type shape at the very bottom! The original is the Black and White graphic, but I’ve created several color versions for you as well, including Fuchsia Pink, Midnight Blue and a Purplish one! These would make fantastic Photoshop Brushes, or great to use on Wedding Projects or decoupage. So many possibilities here! 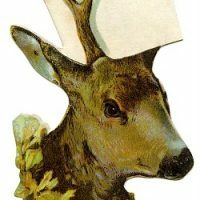 Vintage Christmas Clip Art – Deer Head with Sign – Place Card Vintage Postcard Logo Image! Vintage Black Swan Image – Silhouette! Such a wonderful piece! Thank you, Karen! Hello there I just wondering how do I get the PNG file?? or just click in the image and tight click and copy it. Is there any way this can be download?? Thank you and thanks! this site has a lot of great …awesome graphics! Karen, these are exactly what I have been looking for. They are stunning. So many thanks. Oh these are gorgeous!!! Thanks so much for sharing!